Jamestown brought in Latino Hispanic Heritage Month in epic fashion with SHN Golden Gate Theater and the cast of the ON YOUR FEET! the Broadway musical inspired by the life and music of Gloria Estefan. The cast made a special appearance at our Chavez Elementary School Beacon Site, taking questions from the students and leading them in a conga dance lesson with help from Loco Bloco student performers. Students, teachers and cast members were all smiles as they danced along to the rhythms of Gloria Estefan. The sun was shining down on the Mission District that morning, as past, present and future generations of Latino leaders came together in a moment of joyous celebration. 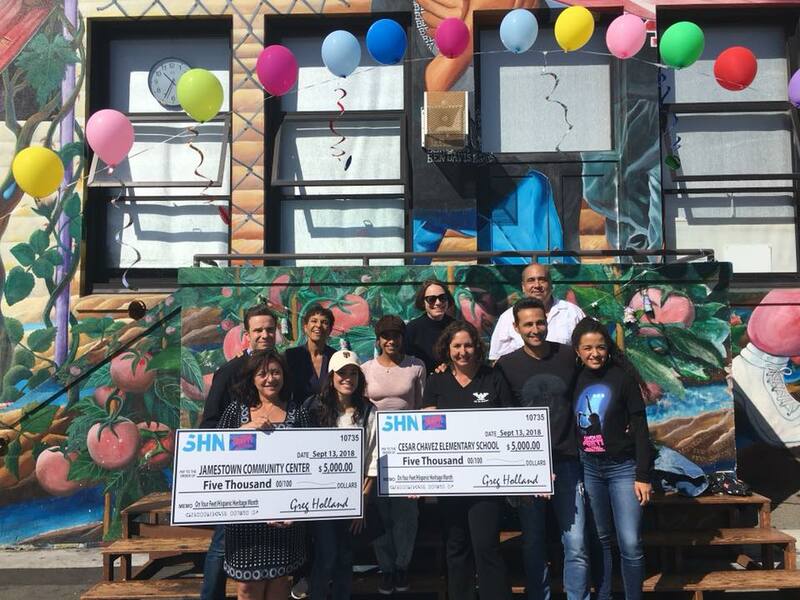 As part of the festivities, SHN donated $5,000 each to Cesar Chavez Elementary School and Jamestown in support of Latino youth in the performing arts. In addition, 175 students and their families received complimentary tickets to a performance of ON YOUR FEET! where Loco Bloco welcomed early theatergoers with a performance in the Golden Gate Theater mezzanine. Our own Arts Education Director Pedro Gomez gave opening remarks discussing the importance of Latino representation in the arts and the trailblazing work of Gloria Estefan. Cesar Chavez Elementary School students and families also received a special video message from Gloria Estefan herself (check it out, below!). Jamestown is incredibly grateful for the opportunity to partner with these amazing artists and organizations to continue fighting for Latino communities in the Mission District and across the globe.